He told me to go back. Twice. “But you can’t do this,” he said as he pointed to the boulders. We were at the beginning of the hike—a hike over 2 1/2 miles of big boulders, some of which wobbled like teeter totters and others that were sharp, awkward fragments like broken pieces of black pottery that slipped from a giant’s hands. Nazca Boobies elegantly perched in groups on these jagged boulders as they watched us humans strain to keep our balance. 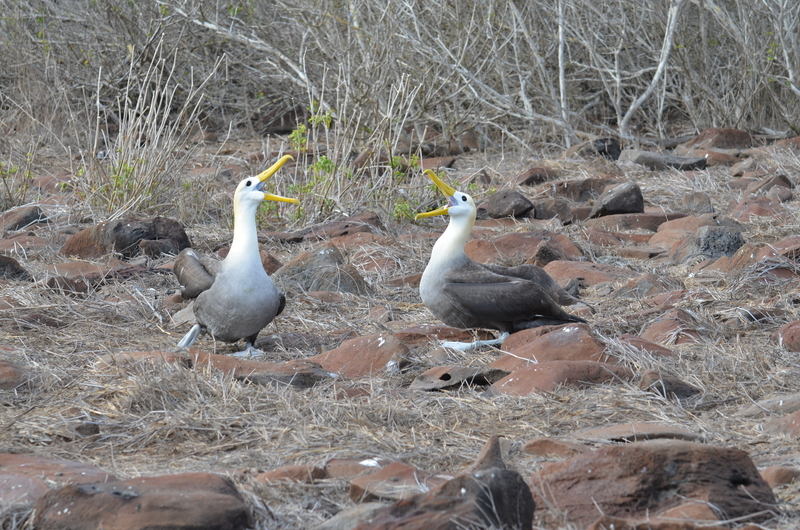 Most of Española island in the Galapagos is like this—a graveyard of broken boulders and stones where nearly the entire world’s population of Waved Albatross breeds. The naturalist turned back to the front of the group, clearly irritated with me. The feeling was mutual. 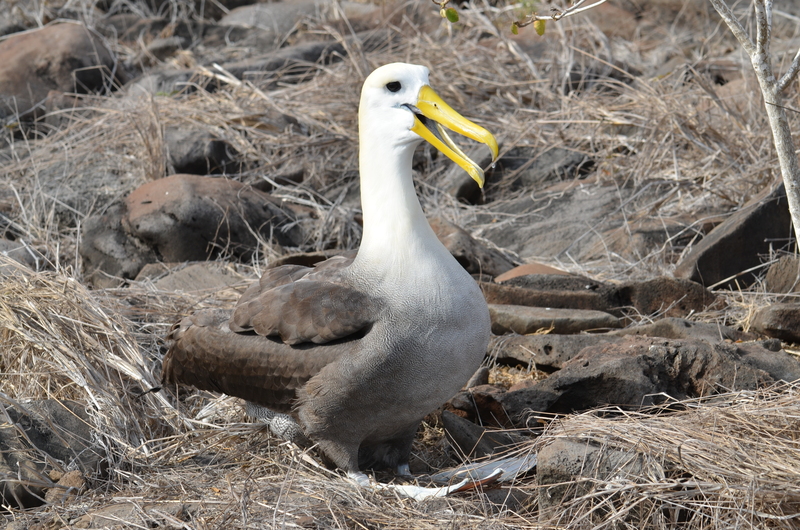 I wasn’t going to come all the way to the Galapagos and miss the Waved Albatross. Not after a year of physical therapy to get my head back into the game. Three years ago I broke two bones straight through in my leg—just above my ankle—while hiking in Zion National Park in Utah. I slipped on a patch of ice on the trail and Steve and some strangers dragged me 800 meters before Search and Rescue came and wheeled me out. Surgery and months of physical therapy kept me from active birding for well over a year. And I thought I was okay last year when we went to Ecuador, but I wasn’t. My fear of slipping again prevented me from doing much of what I planned for that trip. My return to Ecuador this year was going to be different. I went back to physical therapy to re-learn how to manage difficult hikes. For a year, my physical therapist designed obstacle courses on wobbly Bosu’s and rubber balls and narrow planks so I could be ready for this trip. I was not turning back. So I continued to lag behind. Others in the group were lagging too, but probably grateful that it was me getting the pressure from the naturalist and not them. Steve stayed behind me to make sure that I didn’t disappear in the rear of the group. There was no path or trail. You just had to find the best boulders to step on. 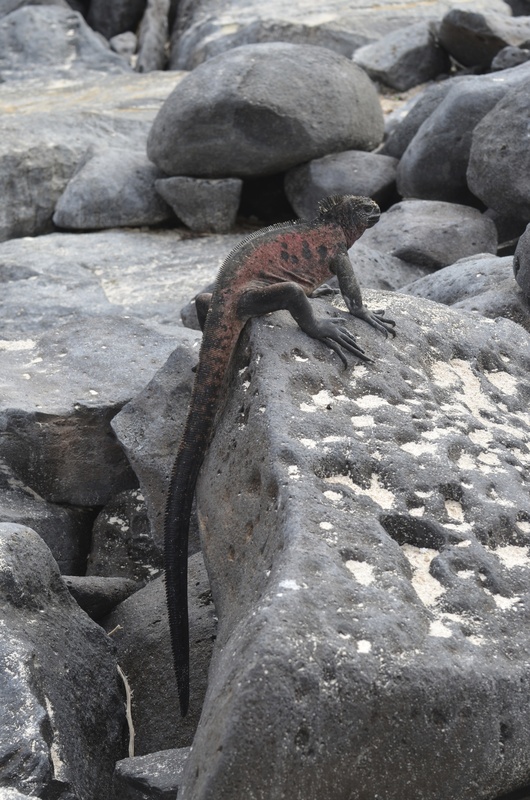 Adding to the challenge were iguanas that were camouflaged against the rocks. 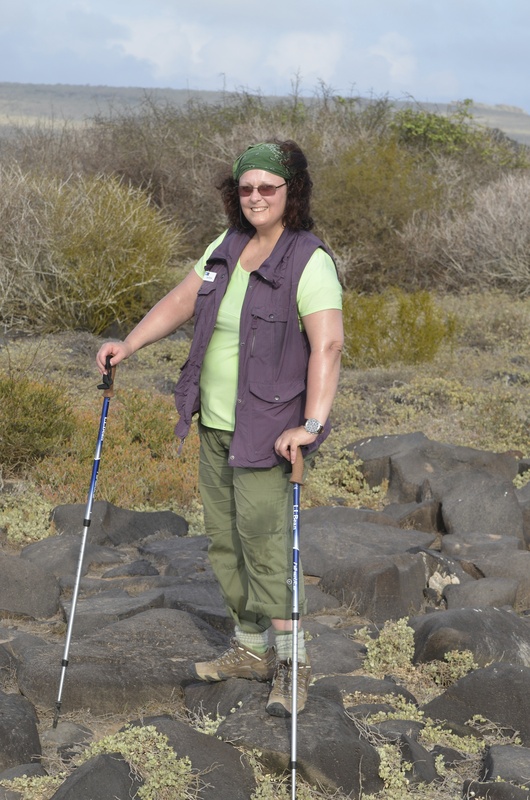 I had to be careful not to puncture them with the point of my walking sticks or step on one. Not only would I probably break another leg, but doing so would be killing one of the mascots of the Galapagos. I’d have more than the grumpy naturalist coming after me. The rest of the world would chase me down with lighted torches. We didn’t practice with iguanas in physical therapy. The sun’s rays were pressing down on me so much my knees were sweating, and drops fell from my forehead underneath my bandana maneuvering their way into my eyes, burning them with salt. We didn’t practice this part in physical therapy where there was air conditioning. The group was ahead of us and around the bend where I couldn’t see them. I chose each rock carefully. Sometimes I had to stop and think of where I was going to place my right foot, keeping in mind where my left foot was going to go. Since the hiking accident, my ankle never fully recovered its mobility and will only bend so far and I’ve had to learn how to tackle hiking in a very different manner, which means I’m slow. But there was no way I was going to break my leg on this hike. For one thing, I’ve been through that trauma before and never want to go through the awful pain and inconvenience again. And the other reason? I wanted to prove the naturalist wrong. I could do this. For a mile I plugged along, looking down at my feet as I navigated across the pathless boulders. There was no rhyme or reason to where you placed your foot. Everyone approached it differently and I tried to mimic the person in front of me if they were close enough, thinking that if they didn’t fall it was probably a good way to go. I heard my name. “Lisa!” It was my grumpy naturalist. “Here’s your Albatross,” he said as if we had been looking for lost keys. Oh my gosh, I’m going to see it! I thought. The Albatross was 30 meters beyond where we were and I wanted to effortlessly hop on my toes from one boulder to another to get to the Albatross. Of course, bouncing from stone to stone would be a disastrous idea so I continued like the Galapagos tortoise as my anxiety about falling and injuring myself washed away. My excitement somehow gave me a little more confidence. 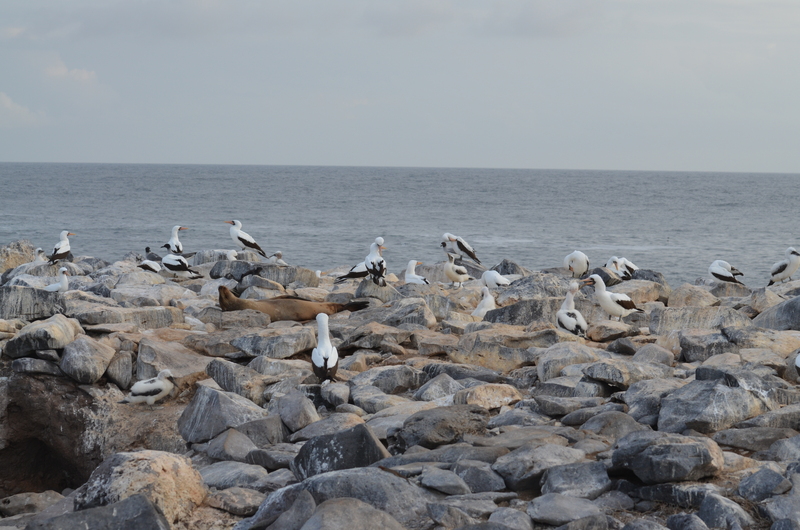 Our group stood around the rookery of 15 Albatross and whispered to each other as though we had just entered a temple. I thought about the conversation I had with Sofia, another naturalist, the previous day. I had mentioned to her that Steve and I live in different countries and see each other once a month. “You are like the Albatross,” she told me with a grin. Yes, we are a couple who are bound together forever and return to each other regularly after a period of separation. It was a connection I now had with both the Albatross and with the Galápagos Islands. Sofia confirmed it. We soon left the Albatross and resumed our hike, stopping by a cliff to watch Swallow-tailed Gulls soar and we all cheered every time water sprayed like a fire hose out of a blow hole. The breeze cooled us off, but the walk wasn’t finished. We still had a mile of boulders to get us back to where we started. Undoubtedly, I was still the slowest one in the group. The Albatross was one of my target birds for this trip and I saw it! I had no idea I was going to have to manage a difficult hike, but I was prepared. I had to do this hike, not just to see this magnificent bird, but to prove to myself that I could overcome 2 1/2 miles of obstacle. No broken bones this time. So yeah, no one was going to stop me. ← Business, birds, gators and drones. It’s all here. Aww, thanks so much Cath! I KNOW! No one gets in my way of my goals. What a great story! I hope you are putting these all together for your book. Hmmmm…book. Now THAT’s a great idea, Sue. Why, thank you, Mr. Tootlepedal. Thank you so much, Jenn. Determination won! Maura and I read this together. Way to stand up to grumpy Paul! You go girl! Says Maura. And I agree. Yeah, you know how I am when I’m around grumpy people who try to get in my way. Ha! I’m happy for you! Congrats! I understand, on a very small level, a little of what you went through – having sprained my ankle very badly over a month ago. It’s so damned frustrating not to be able to be as mobile as you’re used to! And it does take work, and patience, and all that. So I am VERY glad you had your close encounter with the giant, and what a good symbol for you guys. Oh yes, Bluebrightly, you’re right! It is SO frustrating. You hang in there too! If I can do it anyone can.